A package of chicken thighs represents a bounty of possibilities. Though many prefer frying and baking chicken, sautéing is an option that is often overlooked. 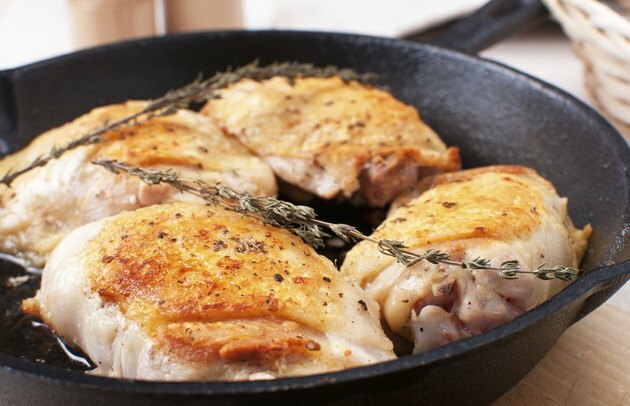 Sautéing is a fast and simple way to cook chicken thighs while keeping them tender and juicy. Full of protein with minimal calories, sautéed boneless, skinless chicken thighs make for a flavorful and healthy meal without having to spend hours in the kitchen. Preheat cooking oil or butter in a sauté pan over medium heat. Use enough of either to cover the bottom of the pan. For extra flavor, add garlic and other herbs to the oil or butter while it is heating. Scoop away the garlic and herb pieces with a slotted spoon after a few minutes when they begin to turn brown, then discard them. If the garlic and herbs burn it may alter the flavor. Rinse the chicken thighs under cool running water to remove excess blood. Slice the thighs into pieces or leave them whole. Whole thighs will take longer to cook, but cutting them into pieces is optional. Place the chicken gently into the pan to avoid splashing hot oil or butter. Season the chicken with your choice of seasonings. Salt, pepper, rosemary, thyme and paprika are just some of the seasonings that go well with chicken. Allow the chicken to cook for 5 to 6 minutes on each side. If the chicken is cut into smaller pieces, stir it frequently with a wooden utensil to help it cook evenly. Cut into the chicken thighs with a knife and fork to check for doneness. The chicken will have no pink all the way through and the juices will run clear when it is ready. A meat thermometer is a useful tool for whole pieces of chicken. Insert the thermometer into the thickest part of the thigh. If it is at least 180 degrees F, it is safe to serve. Remove the chicken from the pan with tongs or a slotted spoon and set it on a plate. Serve small pieces immediately. Allow 3 to 5 minutes before serving whole thighs to allow time for the juices to settle. Serve the chicken thighs over a bed of rice or topped with feta, olives and tomatoes. Keep the leftovers in an airtight container in the refrigerator for 2 to 3 days. If you’re looking to cut out unnecessary fat, use cooking spray instead of oil or butter.